T'is the season for craft books to go on blog tour and today I am very pleased to be a stop (the last one apparently!) 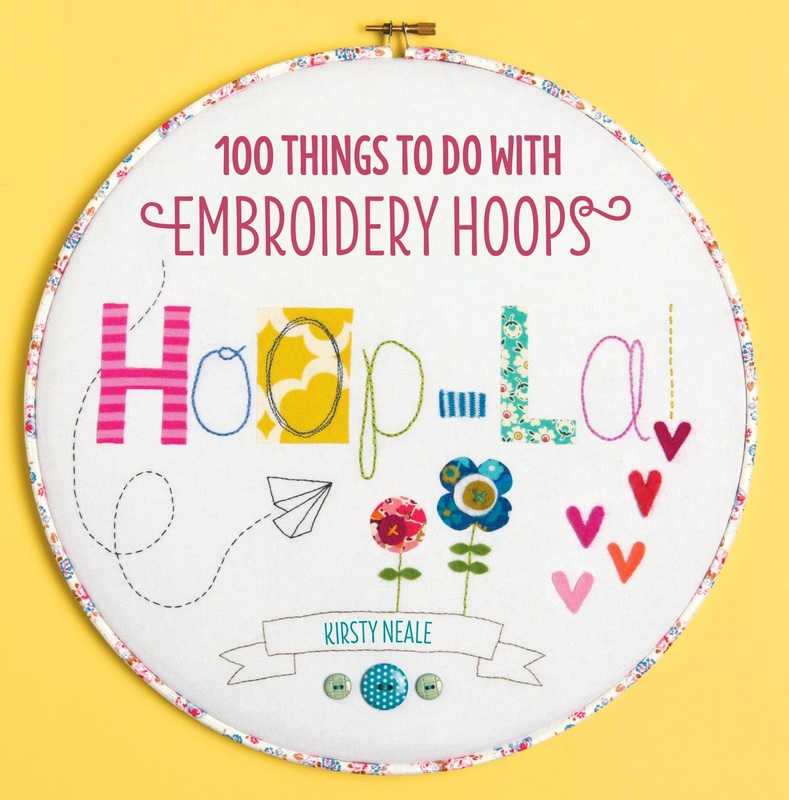 in Kirsty Neale's Hoop-La blog tour. * I was very curious about the book, wondering if the projects would appeal to me as I assumed it wouldn't be a 'regular' Embroidery book. And I'm not a crafty person in the sense that glitter and a glue gun are part of my daily outfit. Luckily for me this isn't a glue & glitter book. It's a very inspiring book with lots (100+) of fabulous ideas. Some projects are practical (wall pocket), some are incredibly sweet (faux taxidermy deer) and others are just very, very clever (Solar system display with Embroidery Hoops, eeep!) A good portion of the projects involve hand stitching of some sort (yay!) and obviously a lot of fabric and felt is used, as well as buttons and trims. So.. yes there were several projects that caught my eye but the Dandy Lion stole my heart. 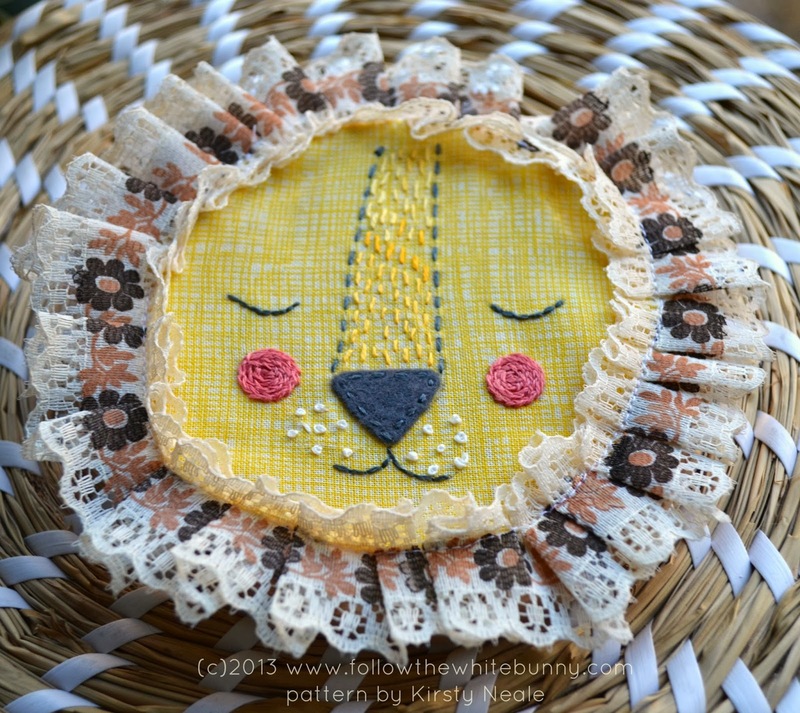 My version is a little different from the Dandy Lion in the book but I think this is exactly what one is meant to do with this book: be inspired, include elements that appeal to you and use what you have hiding in your stash! I didn't have a 7" hoop or crochet 'manes' so I used a smaller hoop and an incredibly dandy vintage trim (thanks Sami!). I also embroidered the cheeks (split stitch in the round worked very well I think) instead of adding fabric ones. A worthy addition to my Embroidery Wall I think…. Check out at this fun video to get an idea of other projects included in this book. 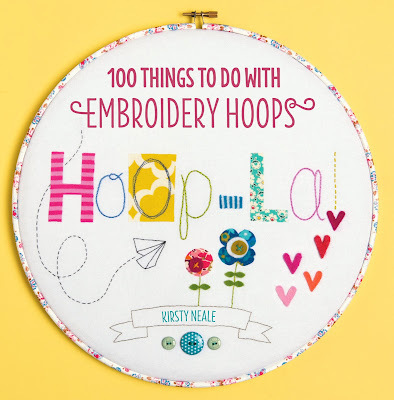 I especially adore the Diorama Bear… You can purchase Hoop-la. 100 things to do with Embroidery Hoops here and here and visit the blog tour page here. Guess what? I get to give away one of the original pieces from Kirsty's book! 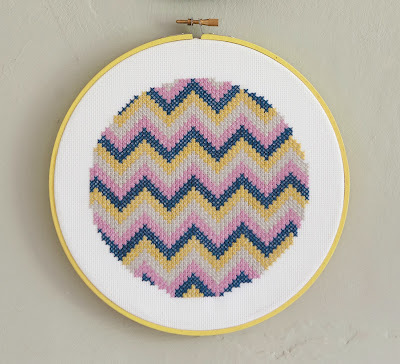 I know this cross-stitched chevron hoop will find a happy home with one of my blog readers. And I also know I would LOVE to have it on my own Embroidery Wall, as it's serious lacking in geometrical pieces! 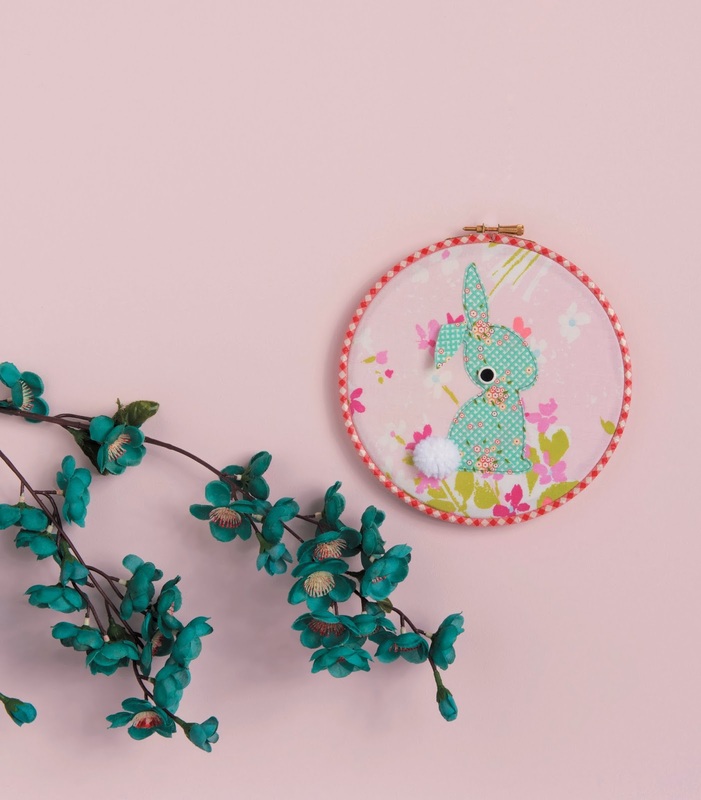 Please leave a comment on this post for a chance to win and tell me what your ideal Embroidery/Hoop Art Wall would look like! The giveaway ends on the 20th of November and be sure to leave some kind of trail so I can find you if you are the lucky winner! Good luck everyone! Comments are closed now! *I received a PDF review copy and the author and publisher were very kind to provide the giveaway prize! All hoops are fabulous but geometric really appeals to me. I adore your lion, the trim is perfect and those cheeks are very clever! Mine would look totally like the diorama bear - as cute as can be! Nothing like some mountains and a bear!! I can't wait to see this book in real life - so many great things in it!! I think my idea wall would be full of hoops of my favourite fabrics! Mine would be anything stitched by you Nicole. I would love to embroider a silhouette of my daughter! I'd like a mix of fabric pieces. applique and embroidery! 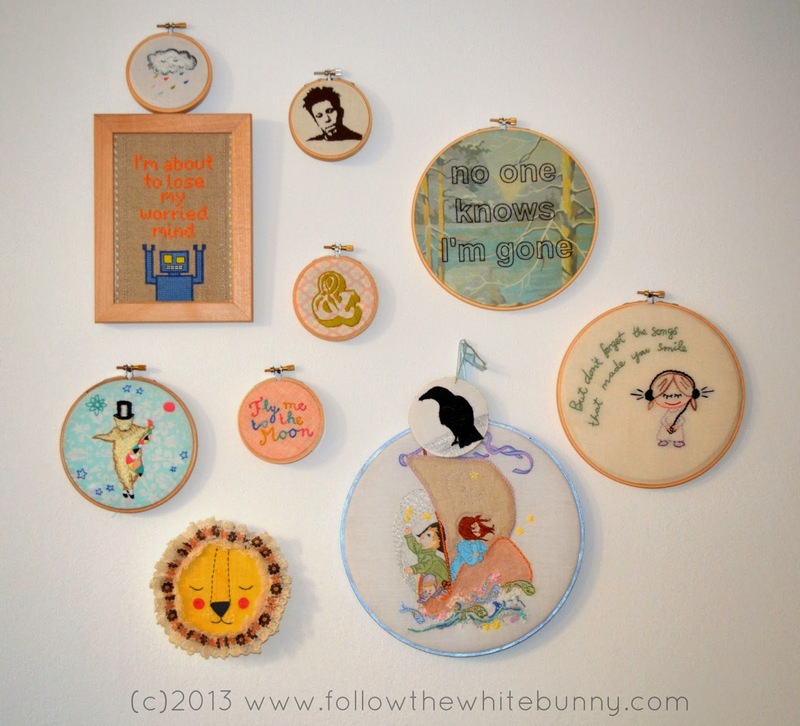 Varied sizes of hoops and frames... with embroidered text and images... Fun! I am in must be said a little obsessed with maps, and have been planning a series of embroidered maps based on my childhood homes. I have started the first but the going is slow and somehow there aren't enough days in the year to do every thing I want to..... May be next year! I've started mine in my studio. It is mostly found vintage designs with owls, birds, mushrooms, anything that speaks to me. I need to add some more modern peices. I'd love one that says infinity times infinity. I have a few hoops with birds embroidered on them ~ so another bird for me! Oh, love the bear embroidery free pattern from you. Printed it out and think it may become a hoop picture too! This is an awesome book! Please don't enter me as I just bought a copy of this :-) But had to comment that your Lion is adorable!!! I'd love to have a feature wall showcasing embroidery of woodland creatures. Bunnies, raccoons, owls...something sweet and fun. That would be my happy place! my first grandson just arrived, and his room is an elephant and giraffe theme. I would live to stitch both to put in hoops and start a wall for him! Love your free bear embroidery design! I like quotes with embroidery, the quotes and embroidery along with them. 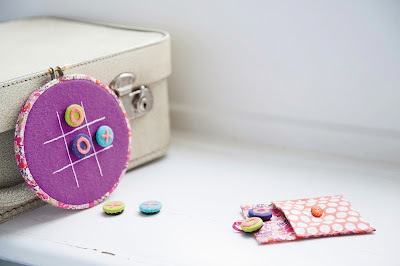 I'd love to have a wall full of hoops with little pockets...the sort you can put your cutter, threads, scissors and keepsakes in.